Following last year’s July trial in July, we’re working with Friction Arts to open Birmigham Sunday Share every Sunday 7am to 11am from 17th February 2019. Birmingham’s Sunday Share will return on a permanent basis on Rea Street South, encouraging the diverse community in the city to come together, chat, share, sell and take part in a range of activities supported by Friction Arts and the Active Wellbeing Society. These events are ideal for families who will be entertained with live music, games and arts activities, right in the middle of the Digbeth area of the city currently the focus of major regeneration. When the Wholesale Market moved from the City Centre early in 2018, the old Sunday carboot on the premises closed, and the hunt for a new venue began. 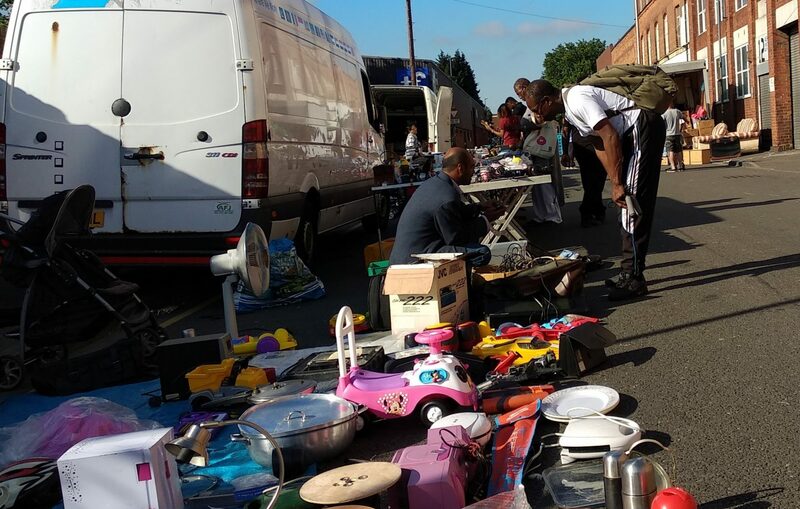 We found location large enough or willing to host a carboot market in the city centre. 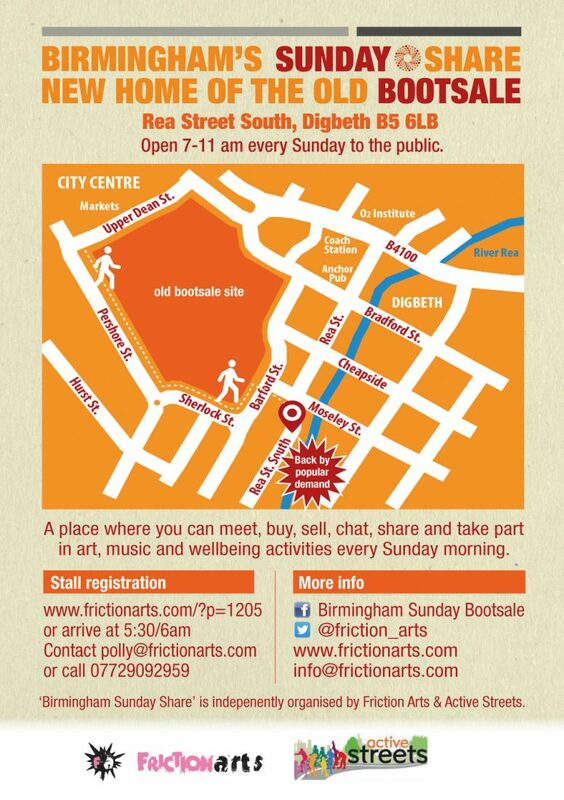 Friction Arts approached The Active Wellbeing Society, having heard about our Active Streets, with the possibility of running a market on Rea Street South, next door to the old Wholesale Market, on what is the most historic trading site in Birmingham, with over 900 years as a Market area. 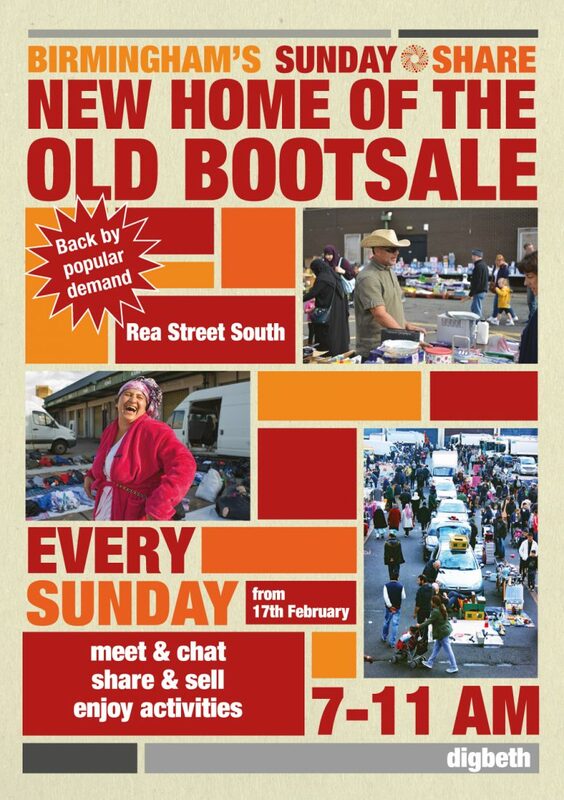 The establishing of the New Sunday Share is bucking a national trend of the demise of street markets in the UK – on Ridley Road, ‘the disparity between commercial development and community interest runs deep.’ and the battle to save the Street Markets are ongoing in Brixton, Hackney, Goldborne Road and Shepherd’s Bush.